Hello, hello! We are officially down to one week before school starts! Andrew starts K3 next week and Alex (gasp!) will start K2 the week after. Holy moly, right?! Let's rewind back to the weekend! Which was...awwwweeeesssommme!! Seriously. Saturday was just a day for the mamas! Like...ALL DAY Saturday! I love my boys so very much, but being able to be out of the house for an entire day was so great. Not having to worry about whether or not we will get home in time for a nap. Not having to clean up after everyone. Nt having to worry about which restaurant has a kids' menu. It. Was. Great. Kristi picked me up at 9-ish and we didn't get back home until 530-ish. Ah-mazing! Wondering where we went? Well, we headed out to the Babypalooza (a baby an maternity expo for mamas). Sure this may not be our first times in this department being mamas already and all. We wanted the free stuff! Ha! Too funny! But, oh...we came home with BAGS of freebies - bottles, formula, giveaway entries, coupons galore, nifty reusable bags (which I love! ), and LOTS of information. It was great. We even ran into a mama friend who got interviewed and was on the news the next morning! Very cool. I did grab a few freebies for the boys, too. Other than the ring pops, this may have been the highlight for them! After that we had lunch and sat at the bar (yeah, I know...kinda mean since we couldn't drink. But, I'm sure we will get out again some time after our babies are delivered. By the way, I love a wonderful Pink Moscato and Cosmopolitans just in case there is a delivery service come November!). Then, we headed out to Buy Buy Baby to get Kristi registered. And, of course, I ended up buying something(s) for Austin! Check out his "going home" outfit! And, how cool is that? 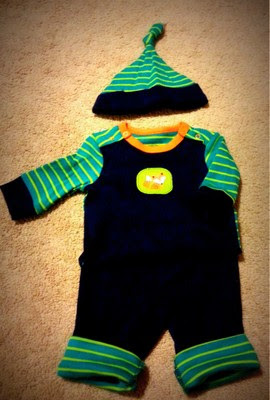 His little outfit has Andrew's blue, Alex's green, and Austin's orange - complete with a little fox on the front! So. Stinkin'. Cute. And how about that hat?! LOVE!! What?! Yes! 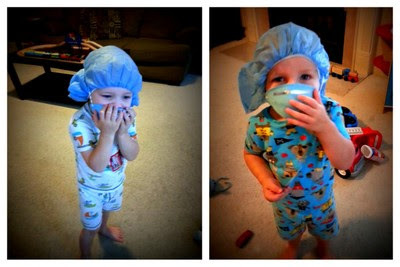 A clean house, 2 little boys who already had a shower and their pajamas, and, of course, a wonderful husband! Awesome. A whole DAY for me AND a clean house... I don't need to win any other kind of lottery. That was the best thing ever! Thanks, guys!! Of course, weekends do come to an end and real life must continue. So, on to this week's goals and menu plan! 6. Begin gathering items for hospital bag with the thing that are ACTUALLY needed/used (some of these lists are ridiculous, people... Who puts these things together? Not REAL moms that's for sure). 8. Do: Paint Austin's room...for cryin' out loud! It's is supposed to be the perfect weekend for this - keep your fingers crossed! Getting hungry after seeing all that I want to accomplish this week? No worries! Here's the menu plan (I actually have the next 2 weeks decided, but I'll just share this week's for now). Well, people. That is all I have for now. As I get some of these projects done, I will post them on our Facebook and Instagram accounts. So, drop by and check us out. Otherwise, you will have to wait until the end of weekend to see our progress.